Indians from across the country have taken to social media to offer shelter to people from Indian-administered Kashmir after a suicide bomber killed more than 40 paramilitary police in the north India state. The attack took place on the Srinagar-Jammu highway about 20km (12 miles) from the main city in Srinagar. A Pakistan-based group said a member in Kashmir carried out the attack but some people directed their anger at innocent Kashmiris living and working across India. There have been cases of Kashmiri students and businessmen being targeted across the country, with reports of some Indian students even demanding the expulsion of their Kashmiri peers from universities. In response, Indian social media has been flooded by locals using the hashtags #UnHateNow and #SafeHaven to open up their "homes and hearts" to Kashmiris being targeted. This support has been offered by several people around India, with locals in Mumbai, Delhi and Pune all offering places to stay. And students across universities from Bangalore to Kolkata have come together to offer their support. The central government has issued an advisory notice to ensure the safety of Kashmiris residing there after reports of sporadic violence against Kashmiri people emerged across the country, though it has warned of false reports. Four traders were injured during violence against Kashmiri businessmen in Patna, the capital of eastern state of Bihar, and a curfew has been imposed in Jammu City after mobs took to the streets and torched vehicles. The central government's special envoy on Kashmir, Dineshwar Sharma, explained there is a "lot of distrust between people from Kashmir and other states. This distrust has led to the difficulties Kashmiri students face while finding accommodation in other states." This comes against a backdrop of significant numbers of young Kashmiri men joining militancy in recent years, with India accused of using excessive force to control protests. But this "distrust" has been challenged on social media, with the mayor of Srinagar urging others to defend "innocent Kashmiris" from such harassment. Others agreed, with some urging for unity, while others said the reports of harassment were simply "creating room for violence, nothing else". 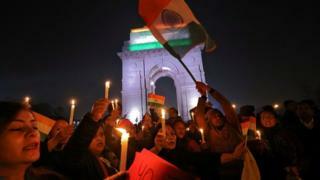 And some said even said they "felt proud to be Indian" after the outpouring of support on social media. Meanwhile, a few Kashmiri students have also been charged for allegedly posting messages celebrating the attacks on social media. Three college students from Kashmir, were arrested in Bangalore on 17 February for posting "derogatory comments" on Facebook about the attacks, according to newspaper The Hindu.